Brady Armstrong delivers a pitch for the Washington C.H. All-Stars during their game against Eaton Friday, July 6, 2018. Along with John Wall and Coleden May, the trio combined for a no-hitter. Coleden May, third from left, returns to the dugout after the first of his three home runs for the Washington C.H. All-Stars against Eaton Friday, July 6, 2018. (l-r); Justin Robinson, who also hit a home run, Hunter Allen, May and Isaiah Haithcock. FAIRBORN — The Washington C.H. 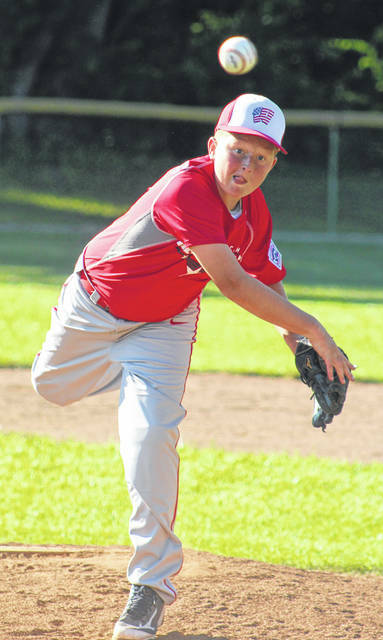 12-year-old all-stars began District 8 tournament play taking on Eaton at Fairborn Friday evening. On a very delightful summer evening, Washington C.H. rolled to a 17-0 win. Washington C.H. will be right back in action Saturday at noon against Fairborn. 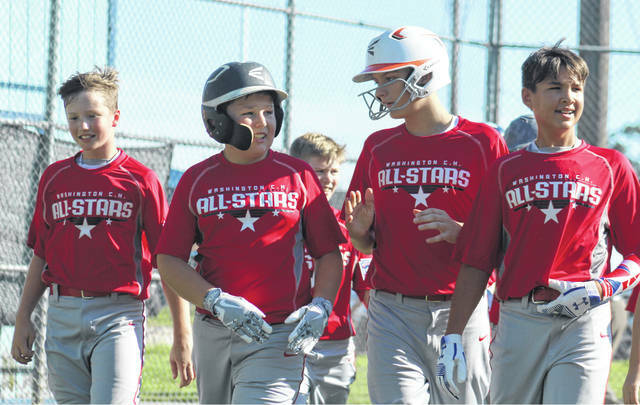 In Friday’s game, the all-stars had three pitchers combine for a no-hitter and offensively, they had 11 hits, including four home runs and four doubles. Brady Armstrong started on the mound for Washington C.H. and pitched 1.2 innings with no walks and three strikeouts for the win. John Wall pitched the next 1.1 innings with two walks and one strikeout. It was during Wall’s stint that first baseman Luke Crabtree turned an unassisted double play when the ball was hit to him on a line and he stepped on the bag to double up the runner. Coleden May was the third and final pitcher for Washington C.H. Over one inning, he walked one and struck out two. May led the offensive onslaught with three home runs and six runs batted in. He hit a two-run home run in the first, a solo shot in the second and after being intentionally walked his third time up leading off the top of the fourth, his turn came around again and he hit a three-run home run. Justin Robinson hit a two-run home run for Washington C.H. in the top of the second. In the top of the first for Washington C.H., John Wall led off with a double and scored on a double by Robinson. Robinson scored when Armstrong reached on an error. May’s first home run gave the all-stars four quick runs and a solid start to the game. In the second for Washington C.H., Will Miller reached on an error and scored on a double by Wall. Robinson’s homer made it 7-0. Two outs later, May’s solo home run put the tally at 8-0. In the third, Bryce Yeazel had a hit, Wall walked and Robinson reached on a fielder’s choice. Yeazel scored on a ground out by Crabtree. Washington C.H. sent 13 batters to the plate in the fourth, scoring eight. May was intentionally walked and Gabe Wightman hit a double. Hunter Hinkley singled both of those runners home to make it 11-0. Yeazel reached on an error that scored Hinkley. Wall reached on an error that allowed Yeazel to score. Robinson was hit by a pitch and Crabtree singled, scoring Wall. That made it 14-0. Isaiah Haithcock walked and on a wild pitch, a Washington C.H. runner was out at home. May then hit a three-run home run that set what would be the final score, 17-0. Offensively for the Washington C.H. All-Stars: John Wall, 2-2, 2 2b, 1 rbi, 1 bb, roe, 3 runs; Justin Robinson, 1-2, 1 2b, 1 home run, 3 rbi, hbp, 2 runs; Brady Armstrong, 0-1, roe, 1 run; Isaiah Haithcock, 0-3, 1 bb, 1 run; Coleden May, 3-3, 3 home runs, 6 rbi, 1 bb, 4 runs; Evan Lynch, 0-1, 1 bb; Hunter Allen, 1-2; Bryce Yeazel, 1-3, roe, 2 runs; Will Miller, 0-0, roe, 2 runs; Corbin Melvin, 0-2; Luke Crabtree, 1-2, 2 rbi; Gabe Wightman, 1-1, 1 2b, 1 run, hbp; Hunter Hinkley, 1-1, 2 rbi, 1 run, 1 bb.